I own a Chevy Corvette. It is the fastest, most responsive car I have ever owned--and I have owned a lot of cars. I love my Corvette. In my three-plus decades overseas, I owned and drove cars from just about every manufacturer and every country that makes cars. Most of them were rather tinny and seemed powered by sewing machines. When I returned to the States, I went on a car buying splurge with money earned by living mostly where you can't buy anything worthwhile. I bought a Mustang GT500 which I loved, too, but my wife hated, so I had to trade it for an Expedition. I also bought a Jeep and a Trailblazer, and now the Queen of my fleet, the awesome Corvette. If you notice, all of my cars have one thing in common: Made in USA. No disrespect for the Germans, Koreans, and Japanese, all of whom make fine cars, but I think American cars, dollar for dollar, are the best in the world. That Expedition can haul an incredible amount of people and stuff in comfort at 80 mph all day, and with surprisingly good gas mileage. The smaller and lighter Trailblazer, also, does a remarkable job of moving stuff around at high speed. The Jeep is a lot of fun, and an iconic beauty. The Corvette, ah, the Corvette . . . she is a six-speed roaring monster that eats highway and is never full. She can out run Japanese and European cars that cost tens of thousands of dollars more . . assuming no highway patrolmen read this blog, I confess that I personally demonstrated this on desert highways--165 mph and she still had more to give. An amazing vehicle. So, this leads me to my topic of today, liberal hypocrisy. I had the misfortune recently of visiting a major university campus. I parked in the faculty lot. My Corvette was the lone representative of American vehicular manufacturing in that lot. I was awash in a tide of cars made in Germany, Japan, and Korea, or by their factories in the US, Mexico, and Canada. That Corvette with its NRA sticker stood out as it was surrounded Alamo-style by these foreign invaders and their Obama and their Co-Exist stickers. Don't get me wrong. I am all for consumers having options, and Americans should have the option to buy foreign cars. I was struck, however, talking to faculty and students by their defense of the Obama "bail-out of the car industry" and their ostensible support for unionized labor. They could not see the clash between how they spend their own money and how they force us taxpayers to spend ours. For whatever reason, these "highly educated" faculty and students buy cars made overseas or by non-union labor in the US, but insist that the taxpayers subsidize the UAW, which to a large extend caused the near collapse of GM and Chrysler. This says a great deal about the sort of whacky liberalism that is taking over our country and driving it to ruin. Public money for these liberals seems to be a infinite quantity that mysteriously appears whenever summoned in the name of a "good cause," in this case bailing out the corrupt UAW leadership and saving it from the consequences of its failed leadership. Obama did not save the auto industry. Bankruptcy did not mean GM and Chrysler would shut down; it meant the UAW would have to defend its contracts in bankruptcy court which it could not do, so the Obamaistas went around the law. There is no understanding of basic economics, and underlines what I wrote earlier about how we are seeing the apparent "end of economics." We live in a time where leftist politicians and their lazy followers ignore or openly defy the iron-clad laws of economics, and think they are getting away with it. I previously quoted the CW song that says "falling feels like flying for a little while," and that is what we're doing: we're falling while the liberals try to convince us we're flying. The laws of economics are like Moloch: he might eat you last, but he will eat you. While on campus, I had the opportunity to talk to white and black history students and mentioned one of my all-time favorite writers and political polemicists, Frederick Douglass, whose portrait I had hanging in my various offices over the years. He was a remarkable and brilliant man who, among other things, wrote an extremely readable and engaging autobiography (three versions, in fact) and wrote newspaper columns on political topics that put to shame most such writing today. He was a true original: a real rebel; an iconoclast; and a man of extraordinary intelligence and personal courage, and had been born a slave. These students seemed either ignorant of or only vaguely aware of Douglass; I could not find one of them who had read his autobiography or his columns. They, on the other hand, had "read"--I have my doubts--more recent mediocrities, and once again confirmed my view that universities in America are merely factories for producing illiterate liberals with no knowledge, yet possessed of an incredible smugness, sense of entitlement, and a reliance on Wikipedia. American universities are garbage, and they are the best in the world. Cheerful thought, eh? Frederick Douglass would have driven a Corvette . . . or maybe a Viper. I would like to read Frederick Douglass. Do you have any volumes you are particularly fond of? HIs autobiography is a classic American story. Let me suggest some LG long tube headers ans a Vortex Rammer for that Corvette. 60-70+ HP instantly, and it bolts on. You can look at the Shelby Mustangs and belly laugh. As Dennis Miller once observed, being best in the world is a little like being valedictorian at summer school. 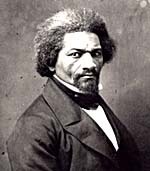 Anon @ 3:02pm, a number of Douglass' works are available as free Kindle downloads. You will find a number of Corvette users being sneered at by the tweed-jacked Porsche crowd, and having too much fun (not to mention, too much class) to sneer back. One of them is (was, anyway), Clarence Thomas. In the 90s he had a ZR-1 (the C4 version of the Vette from Hell of the period) and a personalized license plate: Res Ipsa. You're lucky it didn't get keyed in that faculty lot. NRA sticker? A nearby state university happens to have separate lots for the engineering and real-sciences faculty and the liberal arts, grievance studies, pseudology and pseudo-sciences faculty. Just the way the campus shakes out. The cars in the engineer's lot are hi-po and high-end, and have more of a mix of political or cultural statements. The ones in the lib arts ghetto are mostly beaters, Priapuses, and Volvos being flogged beyond mercy killing as if the reputation of Volvos for near-immortality was a point of personal pride. It was explained to me that the engineers, biotechnicians and other scientists often had patents, inventions, or interests in tech startups of one kind or another. The grievance studies profs spend their spare time making giant papier-maché heads for protests. Not surprisingly they think that activity should be better compensated. Just found this blog, courtesy of Clayton Cramer. My question is, with your political orientation how did you get hired by the State Department? I was under the impression that State is overrun by the types of people who read Amy Tan and find David Sedaris funny. I figured Frederick Douglass was a Lincoln Navigator type. With all due respect to the esteemed proprietor, an older Audi S4 (or better RS4) with its 4WD and twin-turbos leaves a corvette in its dust. And the wagon variant can be taken to Costco or Home depot and loaded up with lots of stuff, taken to school filled with children etc. So you don't need the Ford Expotition. Mind you no one in a grievance studies department would dream of driving such a beast despite its impeccable European origins. I had no idea when I bought my Honda Insight that I was making a political statement. It was a dealer used, fully loaded car that cost me under $20,000. It gets great gas mileage and even talks to me! I love my car! It gets 50 miles/gal on the highway! Is this really something that conservatives need to sling derision at? If so, I am truly sorry that I made a financial decision that causes such angst. babs, Not at all. You have every right as an American consumer to buy whatever you want. My point was if you want to buy foreign-made or non-union made cars, go ahead, but don't demand that the taxpayer then "bailout" the UAW. If you are not willing to put your money there, why insist the taxpayer do so?